Prevacid (lansoprazole) is a proton pump inhibitor (PPI) that decreases stomach acid and effectively blocks the sites where acid is produced in the stomach. This serves to treat a wide variety of conditions that are associated with excess stomach acid. Prevacid is available both over-the-counter and by prescription. 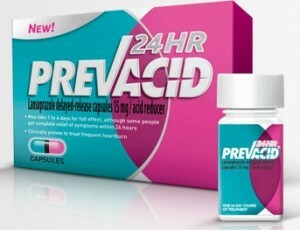 Prevacid is most often available over the counter in a 15mg dosage called Prevacid24HR. To get the full effect of this medication, you must take the entire prescribed dose. This typically lasts for 14 days with a single daily dosage of the medication. Do not stop taking lansoprazole or Prevacid sooner than directed, even if your symptoms are gone. Delayed-release tablets (Prevacid SoluTab) have a strawberry flavor and are designed to break down in your mouth in about 1 minute. 30mg delayed-release capsules are also available only by prescription. Prevacid can be used to treat a variety of conditions associated with excess stomach acid. Prevacid is an effective treatment option for stomach ulcers, duodenal ulcers, gastroesophageal reflux disease (GERD), helicobacter pylori (H. pylori) infections and erosive esophagitis. Prevacid and lansoprazole do not offer immediate relief from heartburn.